Little Sanctuary 'Haven of Rest' sounds like the kind of place you might come to die, and indeed it might be, but only from sheer relaxation. Just 2 hours drive from Cape Town through sandstone mountains whose formations resemble Atlantic breakers on the point of crashing, is the historic hot springs town of Montague. I decided to indulge in a little theraputic dunking but had no idea that I would plunge so literally into sheer hedonism. 'Shall I put your overseas friends in the Bridal Suite?' asked Desmay Mynhardt, manager of her family run 10 acre private heaven, situated in seclusion behind the busy Montague Hot Springs complex. I knew my friend had yearned for a ring on her finger for some time so I thought, why not? Can you believe it, it worked! By the end of the weekend she was a fiancéd woman, and I in the accommodation next door, remained single. I don't know how because I may not have had cherubs on my ceiling, but I did have a sauna/steam shower and such an ample spa bath that two people could easily lose themselves in the rising tidal wave of bubbles. Self-indulgence is guaranteed purely from a practical point of view. It is impossible not to luxuriate amongst an abundance of fluffy white towels and not sink into the sumptious bed swathed in muslin curtains, piled high with plump tasselled cushions.In the morning breakfast comes in bed - on the kind of tray that traps you in - so that you have no choice other than to lift the silver dome to your pre-ordered choice and sip on your Earl Grey.Dressed to thrill with looks to match, Desmay showed us around her Little Sanctuary comprising self-catering thatched cottages and white washed flat roofed apartments climbing with bourganvillia.They all overlook a valley of neatly rowed vines fecund with fruit and tall Tuscany graveyard pine trees. This Italian feel lingers as Georgio 1943 and other second world war POW Italian names can be seen scratched into the walls that they must have built. The apricot pip pathway crackles underfoot all the way up to the sunset lookout, indicating the abundance of fruit grown in the area. Tradition insists that you take a bottle of local sweet Muscadel wine up to the lookout for the stunning sunset and wobble your way back to your bubble bath.An aura of peace and tranquillity wafts into every lovers nook and shaded cranny of the estate, yet this calming atmosphere had taken careful and exquisite planning, aided by a policy of no children or pets. Desmay admits that she actually adores animals, to the point where she togs down to wander through the poorer parts of town administering veterinary treatment and rescuing animals being ill-treated.One little dog that made it home and whose back doubles as an occassional table (did she give it just a little too much kindness I wondered), waddles the grounds, while a cute but wary Jack Russell snipes at the blue and yellow Macaw who hangs upside down and obliges guests with uncomplicated conversation.The raspberry sorbet sunset and the ice-cold champagne grown in the next valley, prompted a toast 'to my engaged' friends. If this all sounds a bit too Mills and Boon, the fact is that Little Sanctuary is the most delightful, romantic, luxurious, spiritually uplifting place this side of paradise.Nor is the 5 Star dream broken by the price, which is excellent value. 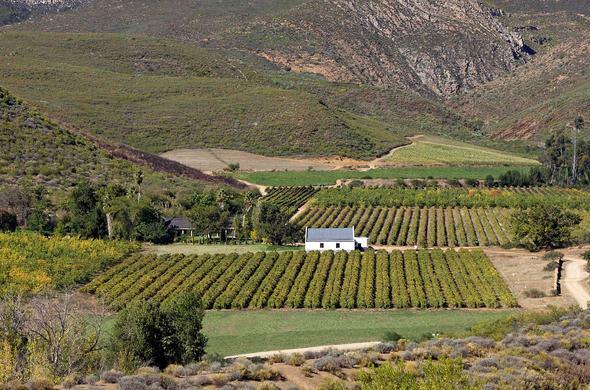 This truly is a place to die for.View more accommodation options in Montagu.Copyright © 2002 Carrie Hampton. All rights reserved. Reproduction in whole or in part without the permission of the author is prohibited.